Whether you’re a seasoned dog owner or just getting one for the first time, it’s important to understand the value and importance of properly training your pup for various commands. While dogs are bred to respect and be a lifelong friend to their human counterpart, it is not uncommon for many of them to have a spirit and mind of their own without proper training and guidance on the leash or off the leash. It’s important to note that ultimately, your pup does appreciate and desire the training you give to them because it helps build trust while also defining and strengthening the dominance hierarchy between you and your dog. It also helps build routine and familiarity which is highly desired by dogs as well. So, when it comes to laying the foundation for training your dogs recall command or improving on it…what are some actionable tips you could implement to get faster and more consistent results? In this article, we’ll discuss 10 tips that you can start implementing that will help you teach your dog to come and to start seeing results sooner than later. 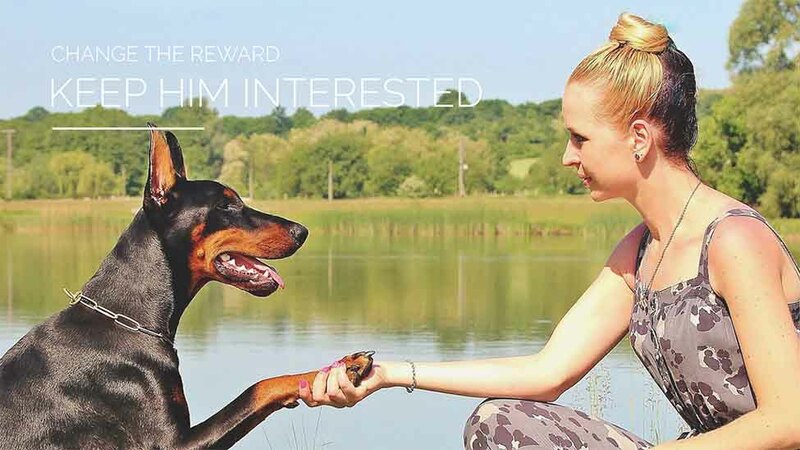 Lets jump right in with learning how to train your dog to come to you with the recall command. When training your dog, it’s very important that you train them using positivity and rewards. This helps them understand that they’re doing something correctly and helps reinforce their behavior. Ideally, you want to reward them with a treat or a fun game they enjoy, but a treat is probably is your best bet. 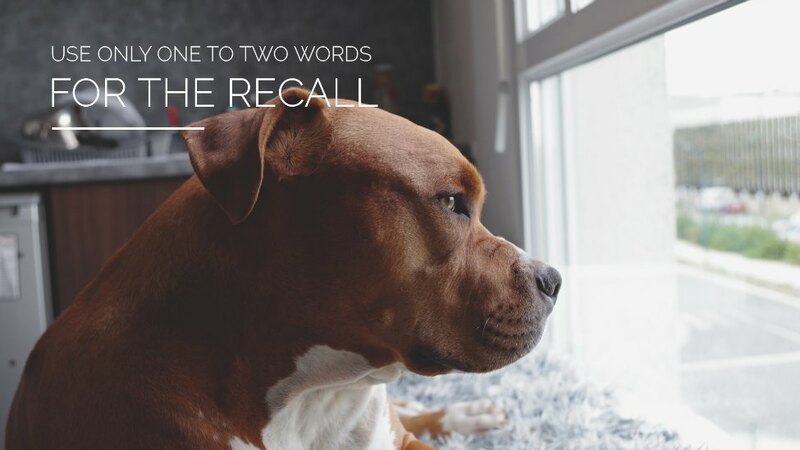 When training your dog’s recall command it’s also important to initially train them using the recall for just one thing, and that is to come to you. For example, if during the training phase you use the recall command to get your dog to come to you but then make them take a bath (which they might hate), they may be less likely to abide by the command the next time around. 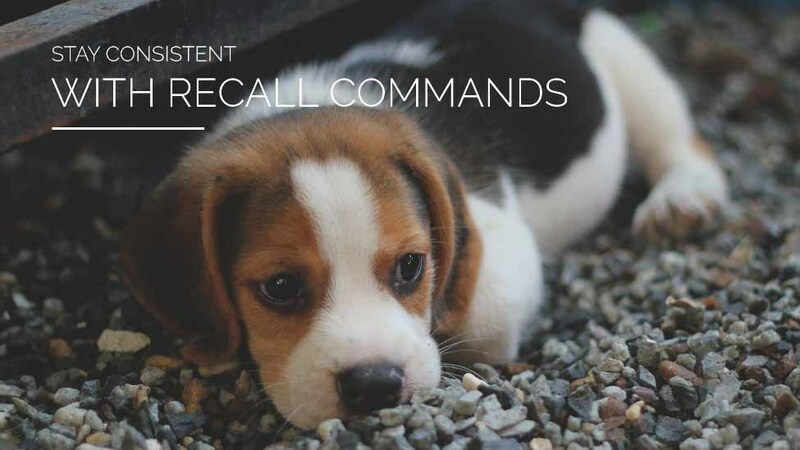 Initially, it’s best to use the recall command for simple, positive requests only until they learn and become more comfortable. When training your dog to come to you, it’s important that you keep the words to a minimum so that they can recognize the unique sound and come to you consistently. If you decide that you want your recall command to be “come”, then saying “come here” might throw your dog off. Be sure to stick with the words you select and be as consistent as possible, rewarding them with a treat or love and affection for each positive return. While staying consistent is a critical part of training your dog’s recall, it’s also worth noting that if you happen to use the same word for negative consequences (like when they poop in the house or tear up the couch) that it may cause confusion and negatively affect your puppies recall capability. For example, if you teach your pup to “come here” as their recall command, you should not use the same words to recall and scold them for littering the house with toilet paper because the bathroom door was open. While we would all love to train our dogs in a single day and have them be perfect pets overnight, unfortunately it’s not that easy. It does take some time to train your pet, regardless of what they’re being trained for and command recall isn’t any different. 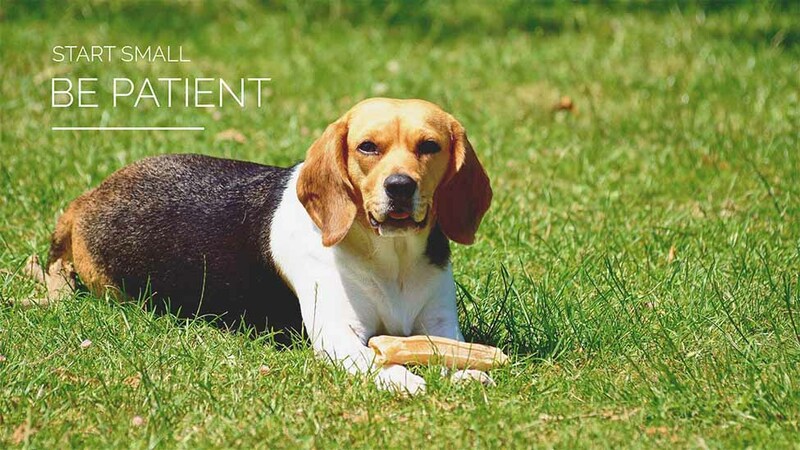 While it is a somewhat easier training area than others, you should know that if you’re dog isn’t ready to “come” between the short distance of your living room to kitchen, they probably aren’t ready to “come” at a large park. How would you like to eat the same chipotle chicken flavored treat for the rest of your life? You wouldn’t! Just kidding. 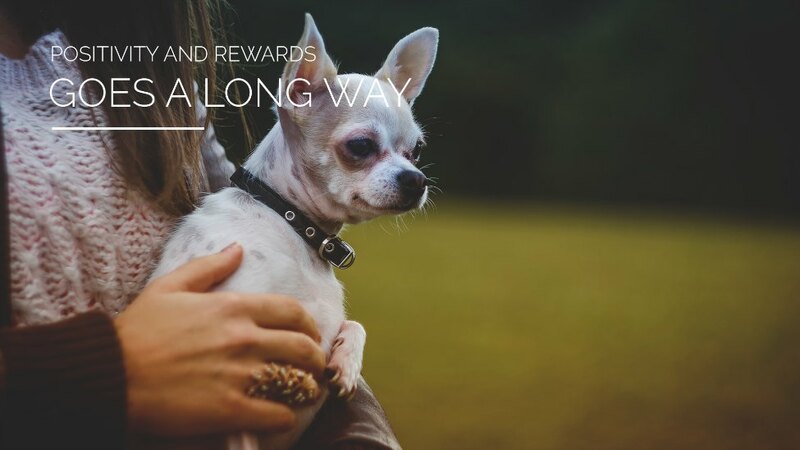 On a more serious note, it’s a known technique that providing your dog a variety of delicious treats will help increase their positive behavior and consistency. Perhaps this is because of the anticipation factor for a new treat or something that tastes a little different from what they’re used to eating all the time. Anyhow, try this out and you’ll see an increase in furry-cooperation! Training a release command for your dog is also a great way to help them learn to how to go back to what they were doing before you called them to you. We’ve also heard the famous “stay” call to keep your dog in place as you move away or do something else. A traditional release command is “OK GO” or “Ok come here!” in which most dogs will spring forward into action either towards you or back to what they were doing. This especially works best when incorporated with an underground or wireless fence product as it gives your pup the freedom he desires. To help train their release command, give them a delicious treat to reward them for listening to you and following the command. While this one seems like a no brainer, it’s a worthy reminder. While your dog doesn’t understand english, he/she can definitely pick up on inflections in the voice and will respond accordingly. If you seem mad, angry, upset or aggressive, your dog will likely be fearful or confused and may not come to you the same way. Keeping an upbeat, happy and positive tone with your dog will always let them know you’re safe and accepting them with open arms. In 2017, the average human’s attention span is around 7 seconds. With that being said, it’s important that you don’t scold or reprimand your pup if they don’t listen to you or get distracted by toys or objects in the environment. Remember that it’s not that they don’t want to learn, it’s that they just need the proper guidance and consistency until they do. To make things easier on both of you, remove and major distractions that may prevent them for keeping their attention and focus on you and the training session. When training your dog to come and if they’re not listening to you, you should assess the situation to see what other factors might be going on (they can’t hear you, they’re distracted, etc) – If you keep repeating yourself and your dog is ignoring you, they’re going to learn to associate and think it is okay to ignore you when you call them. If this does happen, just go to your dog and put them on a leash to re-establish dominance. 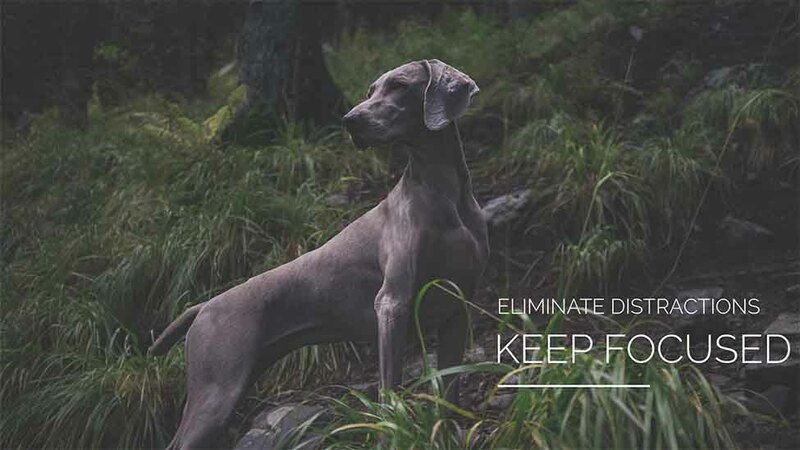 Try keeping your training sessions around 10-20 minutes depending on your dog’s willingness and focus. Many dogs start to lose interest or get bored after that 20 minute mark so keeping things short, fun and exciting is the best way to train your dog to get the results you’re looking for. So there you have it, 10 actionable tips that will help you improve your total recall dog training and command whether you’re brand new or a veteran dog owner. Apply these tips and start enjoying a fuller and more satisfying relationships with your furry friend.